Final numbers are in from the Department of Defense, and as expected, the Army missed its fiscal 2005 recruiting goal by a wide margin, falling short by more than 6,600 soldiers. The Army National Guard, Army Reserve, Navy Reserve and Air National Guard also all missed their recruiting goals, each pulling in less than 90 percent of their targets. But the active-duty Army shortfall — they recruited about 4,000 fewer soldiers than in fiscal 2004 — is especially troubling because the service has already widened its recruit pool to accept older candidates and those with lower test scores, according to Mike Reilly, vice president of operations at the Center for Security Policy. Military, Facing Huge Recruiting Shortfall, Insists "Not in Gloom Mode"
The military will now be taking more recruits who get low scores on military aptitude tests. Until now, the armed forces have been admitting no more than 2% of the recruiting class from enlistees who get a Category IV score, the lowest test score above a failing grade. That'll be upped to 4%. "The Department of Defense is clearly getting desperate for new recruits," Representative Anna G. Eshoo (D-Palo Alto) of California told MTV.com. Eshoo has co-sponsored a bill dubbed the Student Privacy Protection Act of 2005, which, if passed into law, would change a provision in the No Child Left Behind Act that allows military recruiters easy access to student information courtesy of their high schools. 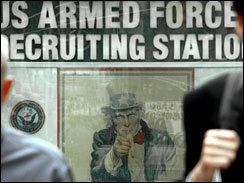 U.S. Army spokesperson Douglas Smith has another take on the incredibly low recruiting numbers. "We're not in gloom mode," Smith said. "We're just looking to open up opportunities to more people. We want to open up the Army to as wide an audience as we can." We're short 7,000 troops this year. Those are 7,000 privates that won't show up in our brigades next year, not 7,000 colonels. So, this is a tremendous shortfall. And it is even more significant and severe in the National Guard, which I think is starting to melt down. Keith, the problem is the U.S. armed forces are at war. And so is the CIA, but the country is not at war. The recruiting challenge is principals, congressman, mayors and parents, not Marine and Army recruiting sergeants. But there are still those who insist all's well, as long as we don't look behind the curtain. In an "opinion" piece on the CBS News site, Stephen Spruiell of the National Review pins down the real reasons for the recruiting shortfalls: Cindy Sheehan. "[The media] are glamorizing Cindy Sheehan and the hundreds of crosses she and her supporters plant wherever they protest — crosses that bear the names of the fallen without the permission of their families. The media, by and large, prefer to convey the recruiting shortfall as a function of the nation's antiwar sentiment that, to them, Cindy Sheehan symbolizes. To report that it is more a function of the booming economy would force them to admit that the economy is in fact doing well, which they are loath to do." I'd love to hear where Spruiell thinks this "booming economy" is. The wealth gap and income inequality are on a steady rise. Consumer spending is down - the Conference Board recently reported that consumer confidence suffered its biggest drop in 15 years in September. Unemployment is up. Plus, all this talk about the economy makes it damn hard for anyone to argue with a straight face that we don't have a poverty draft in this country. Spruiell also points to the retention rates as a good indicator that everything's hunky dory in the military. "[All] of the services met or exceeded their retention goals for the year, with particularly high rates in key combat brigades overseas. Such high rates of reenlistment attest to a belief among the soldiers in what we are doing in Iraq is making us safer and a desire to help that country set up a functioning government that guarantees the Iraqi people a better way of life than they had under Saddam." Or, as you can see in a stunning scene in the new movie Occupation Dreamland, soldiers are berated, intimidated, and harrassed into reenlisting after being told that there's nothing for them at home, that no one will understand them, and that they'll be homeless and jobless if they don't sign up again. Doesn't sound terribly voluntary to me. A widely syndicated AP article today confirms what Counterrecruiter and others have been reporting for months - military recruiting is in serious trouble. Despite assurances from the DOD that things are improving, as the recruiting year comes to a close, the prospects for the year to come aren't looking too hot for the US Armed Forces. The Army is closing the books on one of the leanest recruiting years since it became an all-volunteer service three decades ago, missing its enlistment target by the largest margin since 1979 and raising questions about its plans for growth. The Army has not published official figures yet, but it apparently finished the 12-month counting period that ends Friday with about 73,000 recruits. Its goal was 80,000. A gap of 7,000 enlistees would be the largest -- in absolute number as well as in percentage terms -- since 1979, according to Army records. The Army National Guard and the Army Reserve, which are smaller than the regular Army, had even worse results. The active-duty Army had not missed its target since 1999, when it was 6,290 recruits short; in 1998 it fell short by 801, and in 1995 it was off by 33. Prior to that the last shortfall was in 1979 when the Army missed by 17,054 during a period when the Army was much bigger and its recruiting goals were double today's. While the press seems to have jumped on this story, at least one person in the Army has his head in the sand about the recruiting crisis - which the AP reports "officials" insist is "not a crisis." Captain August Murray was a military recruiter for four years, and he's penned a new book called "Military Recruiting," packed with "lessons, tips and advice" from Captain Murray's "four successful years of recruiting for the New Hampshire National Guard." "Recruiting is a life-changing business," said Murray, who now serves as an instructor for the University of New Hampshire's Army ROTC Battalion. "Recruiters literally change the lives of their recruits. I hope they realize what a wonderful opportunity they have to make a difference." The Army has admitted that it will not meet its recruiting goal for the first time since 1999. The service's top personnel officer, Lt. General Franklin L. Hagenbeck, attributed the recruiting failures to "an improving economy, competition from private industry and an increasing number of parents who are less supportive of military service," according to the New York Times. The article notes that the Army had deployed an additional 1,200 recruiters to America's streets for the summer months in hopes of boosting enlistment, but that it still expects to fall short when the recruiting year ends on September 30th. The Army has recruited 47.121 people through the end of June, the Times reports, and hopes to hit 80,000 new enlistees by October. And that shortfall is despite a new set of recruitment incentives, with new recruits promised rewards totalling "up to" $104,000. But it's not all about the Benjamins. Gen. Peter Pace, the incoming chairman of the Joint Chiefs of Staff, who served as a recruiter in Buffalo for three years, said the military must appeal to American youth in other ways. "This is not about money and benefits; this is about message," General Pace said at a Pentagon briefing on Wednesday. "If we let our young folks and middle-young folks know how much we appreciate their service to their country - there are thousands and thousands of young men and women out there who want to serve this country." On that note, another article in the Times notes that many men and women enlisted in the military are feeling abandoned by an American public that they feel is asked to sacrifice little for the country's on-going wars. "For most Americans," said an officer with a year's experience in Iraq, "their role in the war on terror is limited to the slight inconvenience of arriving at the airport a few hours early." Well, why isn't the public being asked to plant victory guardians or buy war bonds? "The public wants very much to support the troops" in Iraq, [Hendrickson] said. "But it doesn't really believe in the mission. Most consider it a war of choice, and a majority - although a thin one - thinks it was the wrong choice." Demanding little of the public certainly precludes a draft. But with the recruitment numbers so low, what's the military to do? The article mentions a new non-military sort of recruitment, a way for professionals to lend temporary assistance to the military without the messy obligations of a multi-year deployment: the possible creation of "a Civilian Reserve, a sort of Peace Corps for professionals." "In an interview, Douglas J. Feith, the under secretary of defense for policy, said that discussions had begun on a program to seek commitments from bankers, lawyers, doctors, engineers, electricians, plumbers and solid-waste disposal experts to deploy to conflict zones for months at a time on reconstruction assignments, to relieve pressure on the military." From USA Today: The Army wants to double the top cash bonus for new recruits to $40,000 in an effort to stem a continued recruiting shortfall in the midst of the Iraq war. As another incentive, the Army is proposing a pilot program to provide up to $50,000 in home mortgage help for recruits who sign up for eight years of active duty, Lt. Col. Thomas Collins said in an interview Thursday. Two years into the war in Iraq, as the Army and Marines struggle to refill their ranks, parents have become boulders of opposition that recruiters cannot move. Mothers and fathers around the country said they are terrified that their child will have to be killed - or kill - in a war that many see as unnecessary and without end. Recruiters, in interviews over the past six months, said that opposition can be fierce. Three years ago, perhaps 1 or 2 of 10 parents would hang up immediately on a cold call to a potential recruit's home, said a recruiter in New York who, like most others interviewed, insisted on anonymity to protect his career. "Now," he said, "in the past year or two, people hang up all the time. " Military officials are clearly concerned. In an interview last month, Maj. Gen. Michael D. Rochelle, commander of United States Army recruiting, said parental resistance could put the all-volunteer force in jeopardy. When parents and other influential adults dissuade young people from enlisting, he said, "it begs the question of what our national staying power might be for what certainly appears to be a long fight."